Ready to add some fireworks to your July 4 celebration? 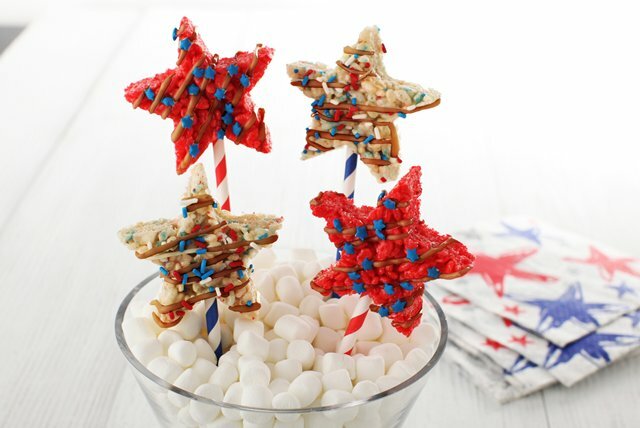 You'll get oohs and ahhs with these star-shape RICE KRISPIES TREATS®. Microwave 2 Tbsp. butter in large microwaveable bowl on HIGH 25 sec. or until melted. Stir in dry gelatin mix. Microwave 15 sec. ; stir. Add 3 cups marshmallows; toss to evenly coat. Microwave 1-1/2 min. or until marshmallows are completely melted and mixture is well blended, stirring after 45 sec. Add 3 cups cereal; mix well. Press onto bottom of 8-inch-square pan sprayed with cooking spray; cool. Meanwhile, microwave remaining butter in separate large microwaveable bowl 25 sec. or until melted. Add remaining marshmallows; toss to coat. Microwave 1-1/2 min. or until marshmallows are completely melted, stirring after 45 sec. Add remaining cereal; mix well. Press onto bottom of separate 8-inch square pan sprayed with cooking spray; cool. Remove cereal mixtures from pans. Cut into star shapes, using 2-inch cookie cutter. Insert red or blue paper straw into side of each. Melt chocolate as directed on package; spoon into resealable plastic bag. Cut small piece off one bottom corner of bag; use to drizzle chocolate over stars. Top with sprinkles. Serve in a large bowl filled with additional miniature marshmallows. Substitute star-shaped sprinkles for some or all of the multi-colored sprinkles. Add 1/2 cup boiling water to remaining dry gelatin mix in medium bowl; stir 2 min. until completely dissolved. Stir in 1/2 cup cold water. Refrigerate several hours or until firm.